Losheimergraben, German-Belgian border, December 24, 1944. The evening sky was clear on this Christmas Eve. After sunset, temperatures had dropped below zero celsius and a bright moon lit the Ardennes forest with a milky glow. 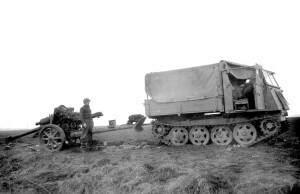 A convoy of the Volksartillerie Korps (mot) 402 was making its way across the intersection of Losheimergraben. As part of the 6. Panzer Armee, the separate artillery Corps was attached to the I. SS Panzer Korps and deployed in support of different units attacking the Elsenborn Ridge. The artillery unit was constituted of five battalions, equipped with medium and heavy guns and howitzers. For its part, the I. Battalion had 3 batteries, each equipped with six 75mm FeldKanone 40 towed by RSO tractors. Monsters out of a folk tale, cat eyes lit and heavily camouflaged with pine branches, the slow moving column offered an eerie sight under the moon. There was a furtive shadow on the snow covered landscape. Darkness was suddenly shredded with tracers and flames. Flying intruder missions, Mosquitoes of the British 2nd Tactical Air Force were in the air that evening. « Jabos! ». The dreadful air attack warning resonated all along the column (note: « Jabos » is derived from Jagd-bombers, literally fighter – bombers). The column instantly liven up like a turned over ant-hill. Truck and prime mover drivers tried feverishly to leave the road as the crews ran away to find shelter in the nearby forest. Out of breath, sliding and tumbling in the darkness, 33 year old Franz Kuwilsky jumped in a shallow depression. At 400mph, the Mosquitoes raked the column with their 20mm Hispano cannons and machine guns. On the ground, devastation and terror were emphasized by the darkness. After shooting up the lead vehicles, the Mosquitoes came back to finish the job, strafing and dropping 500lbs bombs. The tactic was fieldproven. The first ship would shot up the lead vehicles and the following aircrafts would sweep the last ones. Unable to move forward or backward, the center of the column was an easy target to destroy. When the Mosquitoes broke away, the road to Büllingen was littered with vehicle parts, ripped open and smoking wrecks. 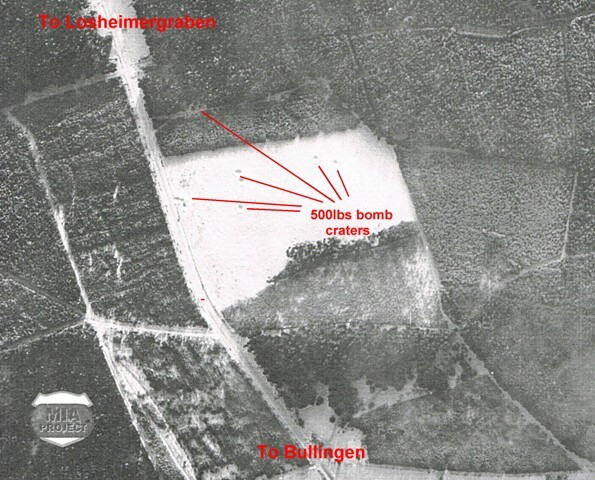 Laconically, the mission report would simply mention : « A collection of enemy armor was hit in the Foret de Bullange ». Several days later, after the 3. 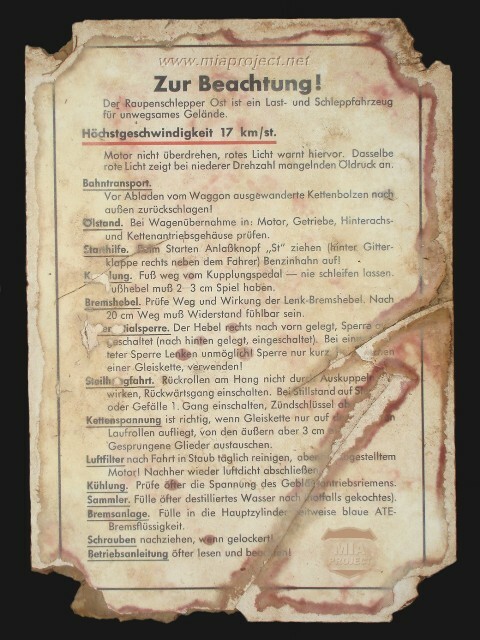 Batterie reached its positions, a clerk wrote beside Kuwilsky’s name: « Vermisst am 24. Dezember an der Losheim-Büllingen strasse » (missing in action on December 24 on the Losheim-Büllingen road). What happened to the 33 year old artilleryman will remain unknown for the following 40 years. The crossroad of Losheimergraben and the road leaving to the west had seen intense activity throughout the last trimester of 1944 and the first of 1945. 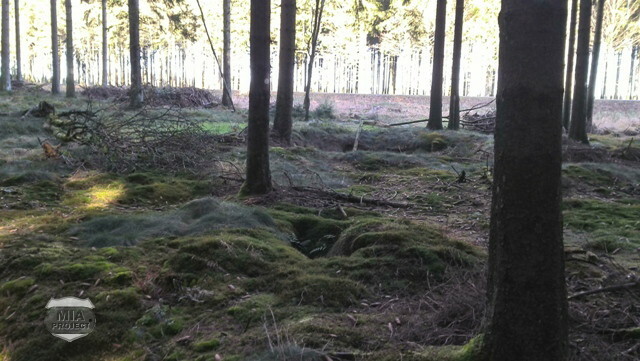 Prior to the Battle of the Bulge, the general area was part of the ‘ghost front’. A quiet sector of the front line where large numbers of troops rotated throughout the months of October and November. The crossroad then became the scene of fierce combats in the early days of the Battle of the Bulge. In February 1945, the same place was recaptured and became the area’s most important entry gate into Germany for US troops. Such an intense occupation left an imprint in the ground. 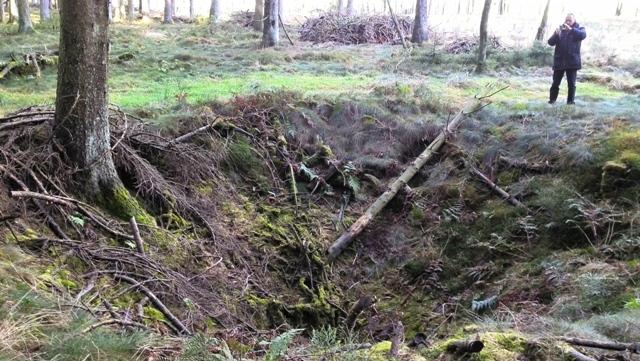 Countless foxholes could be seen and military equipment littered the forest floor. In the early 1980’s the place was well known by souvenir hunters and represented an interesting search area. 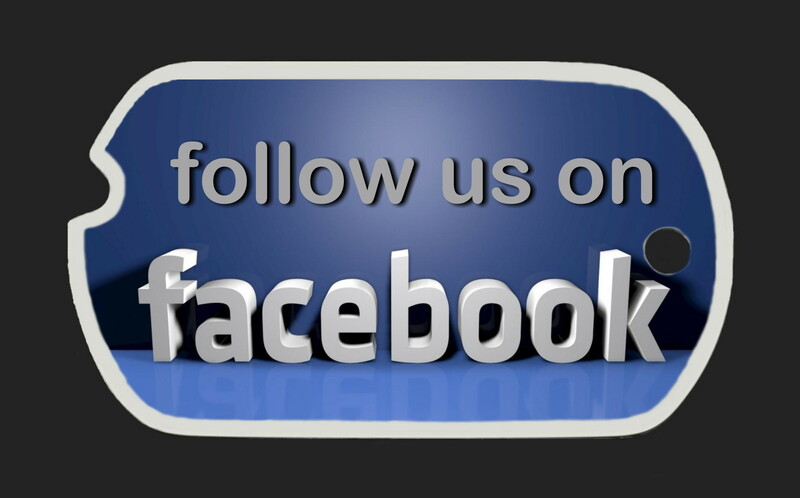 Including for Speder and Seel. The search for battlefield relics took an unexpected orientation in September 1984 when Seel received a call from a fellow searcher. He was just back home from a day search near Losheimergraben. He had unearthed a German dogtag, it read : 2020A – 2./Jnf.Ers.Btl. 465 (serial number 2020, blood group A, 2nd Company, 465th Reserve Infantry Battalion). 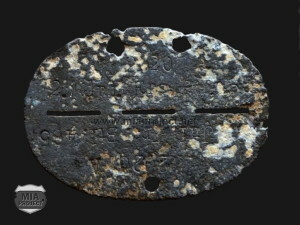 With the dogtag, human bones also surfaced. The dead German was laying face down in a shallow depression. Relic hunters routinely defused ordnance and Belgian police had no tolerance for such hazardous activity. Embarrassed by his discovery, Seel’s friend had reburied everything. He was willing to declare the remains but feared the contact with the police or the forest authorities. For Seel and Speder, it was inconceivable to lay human remains undeclared in the forest. This sure worth the risk, a calculated risk. 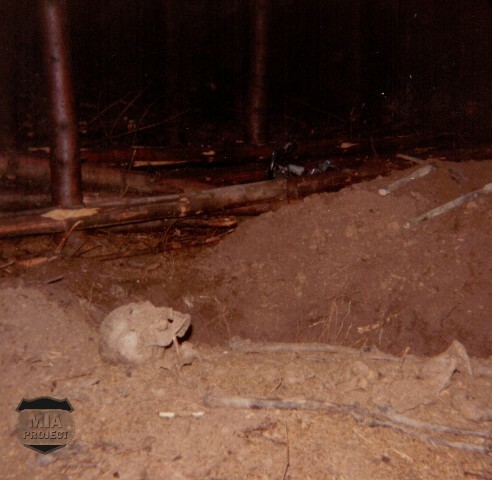 Seel offered his help to completely exhume the remains and suggested to declare them himself to the forest ranger when the site clearance would be over. Seel and Speder knew him and believed he would cooperate even if the name of the person who found the grave was withhold. The exhumation began on September 13, 1984, when Seel and Speder were guided to the site. The grave laid sandwiched between two huge bomb craters, one was big enough to conceal a car. The German soldier was still wearing an overcoat over his uniform but surprisingly had no belt, suspenders, ammo pouch or helmet as his infantry dog tag would have suggested. Only a pipe and a watch were found in his pockets. the unfortunate soldier was also wearing a gold wedding ring. 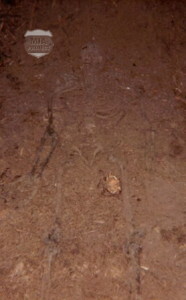 At the end of the day, the skeletal reconstruction outside the grave was completed. What struck the Belgians was the many bones bruised at the time death occurred. This was undoubtedly in relation with the two bomb craters. What happened there? Who was the hapless soldier? Many more questions remained in suspend. As agreed, Seel and Speder went to the Ranger’s office while their friend was heading home. Night had fallen by the time the trio came back to the site. The scene seemed unreal in the light of the Ranger’s flashlight. When the yellowish beam caught the skull, he barely controlled his surprise. As expected, he agreed to declare the remains as found by hikers. Deutsche Dienststelle in Berlin, the German governmental organization maintaining military records, soon identified the remains as Gefreiter (Corporal) Franz Kuwilsky, a 33 year old resident of Dedersted, then East Germany. 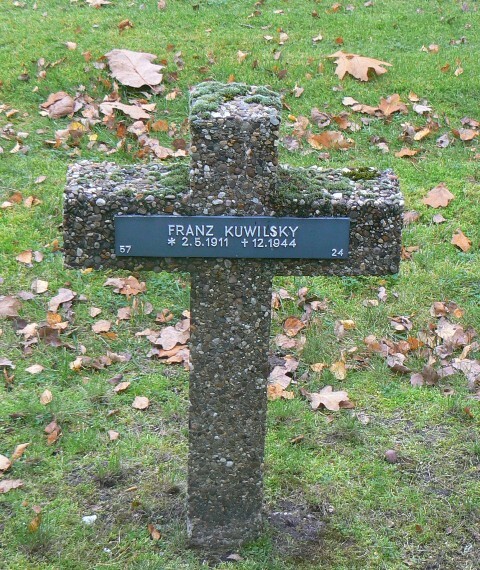 Kuwilky was attached to the 3rd Battery, Volksartillerie Korps 402 and was reported missing in action since December 24, 1944. Bill Warnock’s ensuing research revealed that Kuwilsky’s unit had been attacked by RAF ground support aircrafts who unleashed 500 pounders bombs. 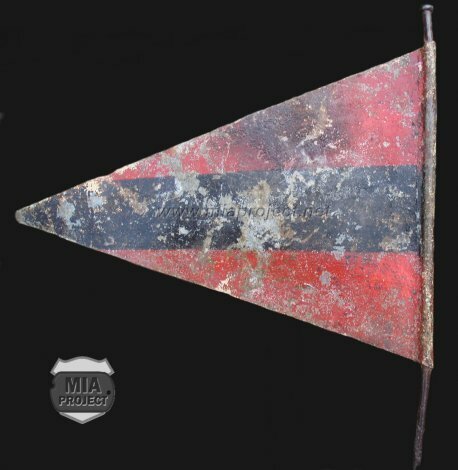 To this date, it has not been possible to identify the type of aircraft and subsequently the squadron that raided the German column. However, cross references would indicate that RAF Mosquitoes or RCAF Typhoons could be credited for the attack. Air activity over the north shoulder of the Battle of the Bulge was intense on Christmas Eve and reports fragmentary. Over the years, more pieces were added to the puzzle. The discovery of an unexploded 500lbs bomb of British origin near the crossroad would confirm the RAF activity over the road. 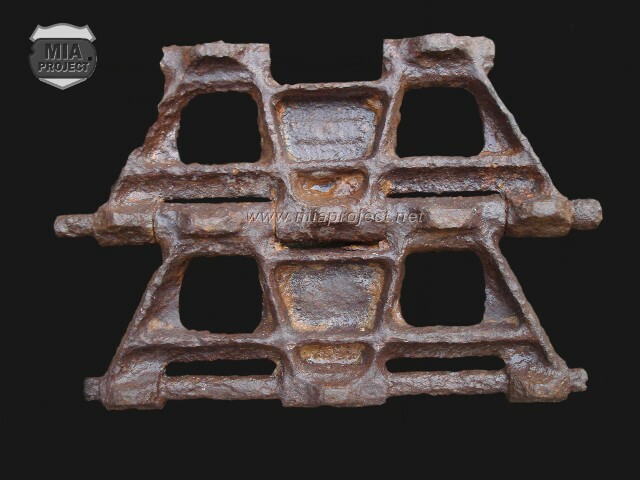 A number of German equipment, such as RSO tractor pieces and German artillery identification equipment were also recovered in the vicinity. The story came to an end when Franz Kuwilsky finally received a dignified burial in the German military cemetery of Lommel (Belgium). Sadly, because his hometown laid behind the Iron Curtain in East Germany, nobody of his family attended the funeral. It was the very first time Speder and Seel were directly participating in the recovery of human remains. This impacted the Belgians in the way they had searched the battlefield and generated an new interest for missing soldiers.